My previous car was a 2001 BMW M3, and I wanted a bigger car, for my family of four, whose performance could also exceed that of my M3. 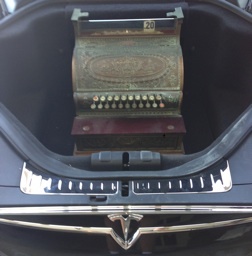 This P85 Tesla Model S was the answer. These pages chronicle our adventures in a high-performance electric car. using the Tesla Supercharger and Destination networks. A 946-mile round trip from Orange County to San Francisco using the Tesla Supercharger network and the development of a Supercharger Table. A 450-mile round trip from Orange County to San Luis Obispo using the Buellton Tesla Supercharger. A 334-mile round trip from Orange County to Santa Barbara using the Rancho Cucamonga and Oxnard Tesla Superchargers. A 635-mile round trip from Orange County to Las Vegas using the Barstow and Primm Tesla Superchargers. 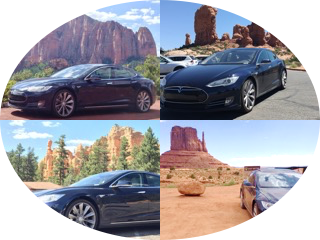 A 931-mile winter round trip from Orange County to Grand Canyon Railway using the Tesla Supercharger and Destination networks. Where can I go on a single charge? 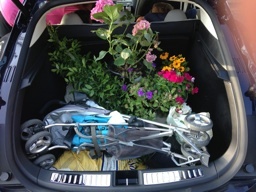 Exercising this electric car's cargo capacity. I am gas free and rely on this electric car as my primary, daily vehicle. This electric car charges at home, far more convenient than driving to a gas station, over 94% of the year. Reached 50,000 miles, on I-15 crossing the Mojave desert, air conditioning on with 112°F outdoors at 5:51 pm on Father's day. Use this link to order a Model S, 3, or X with 6-months free Supercharging. Car & Driver: Model S P85D makes everything a projectile - with slo-mo! Consumer Reports Top Picks 2014: Model S wins "Best Overall"
"The Model S is unlike anything I've ever driven and the performance is like nothing else I've ever felt. Not just the speed, but the odd combination of tranquility and violence that really has to be experienced to be understood." "My verdict? After 1,000 km of effortless driving through four countries, it was a jolt - literally - to reluctantly return to the "old" ways of a grumbly modern diesel. 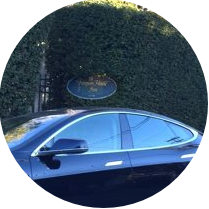 The Tesla's sophistication is unquestionable and now the support infrastructure is joining up fast so that a cross-Europe trip needs little more planning than hotel bookings you'd make anyway." "The D can satisfy nearly every desire for an everyday driver: family sedan, sports rocket, all-weather confidence, top safety rating and the most user-friendly interface on the market." "Tesla is revolutionizing the industry." cArs Technica: "This car makes me feel invincible." - I couldn't agree more. "It's the car of the future." The Tesla Model S finds itself in good company on Science Channel's How It's Made: "Dream Cars", alongside Bugatti Veyron, Alfa Romeo 4C, Superperformance MKIII. The Guardian: Solar has won. Even if free, coal power stations cannot compete. Over their lifetime, battery electric vehicles produce far less global warming pollution than their gasoline counterparts - and they're getting cleaner. Addressing the allegation this Model S is "coal-powered", only 0.27% of electrical power generated in California is coal. The rest is 60% natural gas, 30% renewable, and 9% nuclear, etc., according to the State of California's Energy Almanac. My nearest major power station is natural gas, and I help offset that load with roof-mounted solar panels. What if an electric car driver then test drives a gas car for the first time? "We've reached a point where success is jeered." "Here's a guy who built a car company from scratch and being extremely successful with it. I think it's wonderful. It's really what America is all about." 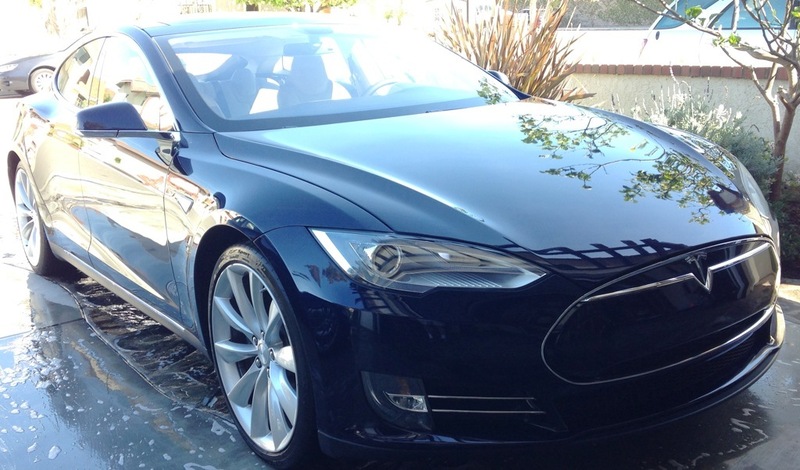 "[The Model S] is a brilliant car.... really well-engineered." "Engineers will save the world"
"I've got [a Model S]. Fantastic car!" "I don't understand why people attack this car. It is made in America, by Americans." "Progress is also the secret propellant of stocks .... progress is worth celebrating." "Americans [should] be as proud of the Tesla Model S as we used to be about the moon landing or about winning the Cold War." 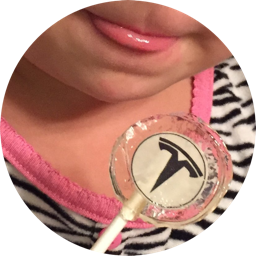 "[Model S] is a towering achievement brought to us by people who really do care about making the future happen in the real world..."
"Tesla has made the American automotive industry great again, and for that every American should all be proud." "Pick up a Tesla right now, and you are buying the most technologically advanced car on the road." "... early Tesla adopters weren't fools. Pioneers, if not heroes. Without them the Model S wouldn't be as brilliant as it is today." "This is not a right or left issue. I know as many liberals who own Teslas as I do conservatives. Energy independence is an American issue." Dean E. Dauger holds a Ph. D. in physics from UCLA, where his group created the first Mac cluster in 1998. Dr. Dauger is the award-winning author in multiple American Institute of Physics' Software Contests and co-authored the original, award-winning Kai's Power Tools image-processing package for Adobe Photoshop. After founding his company, Dauger Research, Inc., its debut product, Pooch, derived from Dr. Dauger's experience using clusters for his physics research, was soon awarded as "most innovative" by IEEE Cluster and continues to revolutionize parallel computing and clusters worldwide with its patented technology. Copyright © 2014-8 Dean Dauger.